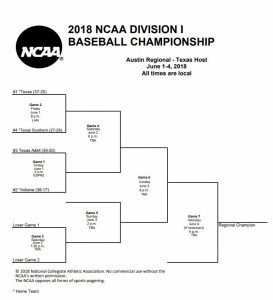 Hoosier Baseball has earned a #2 seed in the 2018 Austin Regional. This will be our 3rd trip to the NCAA tournament in the last fours seasons and our second consecutive #2 seed. Texas, as the host, is the #1 seed, Texas A&M is the #3 seed and Texas Southern is the #4 seed. This is a 64 Team Tournament broken down into 16 four team Regionals. The four teams play each other until 3 have lost twice. The winner moves on to next weekend which is the Super Regionals. 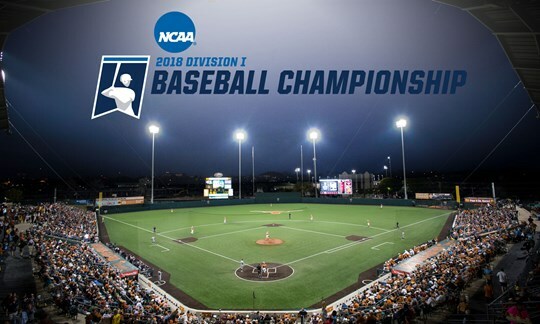 The Super Regionals are the remaining 16 teams paired off playing a best 2 out of 3 series. Winners go to the College World Series. Those 8 teams are split into 2 sets of four playing double elimination in Omaha, Nebraska. The Mecca Of College Baseball. When it is down to two it’s a Championship Series. 2 out of 3 to determine the National Champion. Forget all that, when are the games gonna be and how can I watch them? The games will be spread out throughout ESPN Networks and the Watch ESPN App. Channels will be determined once opponents are known. Check with @iubase17 on Twitter for updates. 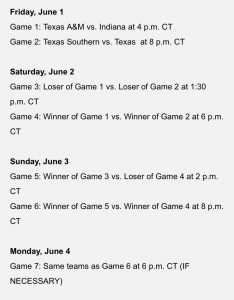 Hoosier Baseball’s first game is against Texas A&M on Friday at 5pm ET. It will be broadcast on ESPN 2. Win that game and it’s Sunday evening at 9pm ET. Lose on Friday Night and it’ll be against the loser of their game on Saturday at 2:30pm ET. Lose twice anytime and our next game will be during Fall Ball. Win the day game Saturday and it’s a must sweep day night doubleheader on Sunday vs both remaining teams. Sunday Game times would be 3pm ET and 9pm ET. If a deciding game on Monday is needed it will be at 7pm ET winner take all. I know it’s complicated but basically lose twice any time and your out. Lose once and winning the Regional becomes more difficult but not impossible. What do we know about the three teams in our Regional? Can Hoosier Baseball Win this Regional and advance to The Supers next weekend? It can happen but this will take an outstanding effort from all aspects of the game. The crowds will be loud, the pressure will be high and the execution must be there. Limit the free runs, limit the free outs and take advantage of any and all opportunities that come our way. We are far from the favorite but June Madness has shown us through the years to expect the unexpected. 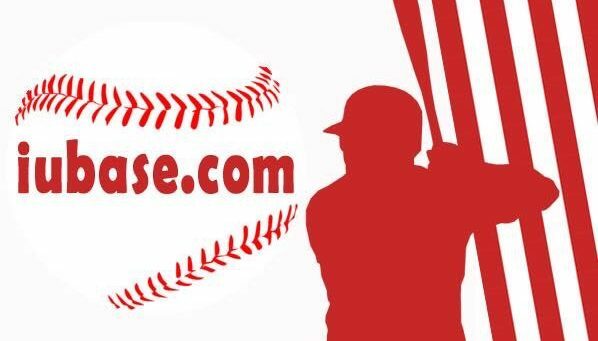 If interested in joining our iubase.com brackets group over at D1Baseball.com just check out this link. Somebody is winning a really good chair.